Capsule o shouder-jynt (distendit). Anterior aspect. In human anatomy, the shouder jynt (in Doric: shoulther) comprises the pairt o the body whaur the humerus jyns the spaul-bane. The shouder is the group o structures in the region o the jynt. 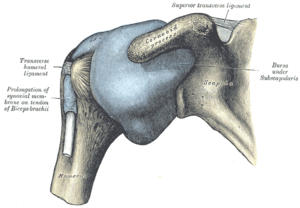 It is made up o three banes: the hausebane (clavicle), the spaul-bane (scapula), and the humerus (upper airm bane) as weel as associate muscles, ligaments an tenons. The articulations atween the banes o the shouder mak up the shouder jynts. It is a helpfu pairt o the body for tae cairy things: we aften help cairyin things wi our ain shouder. Atlas cairied the Yird an the globe o the Sky (Lift sphere). Wikimedia Commons haes media relatit tae Shoulders. This page wis last eeditit on 22 Februar 2018, at 21:56.